As Brittany Lang hits golf balls off a tee, the contact makes a ping that sounds exactly the same every time. It is a sound that a certain onlooking Kid Reporter wishes he could make on his drives. But on this day, they practice for the same reason: to be better. 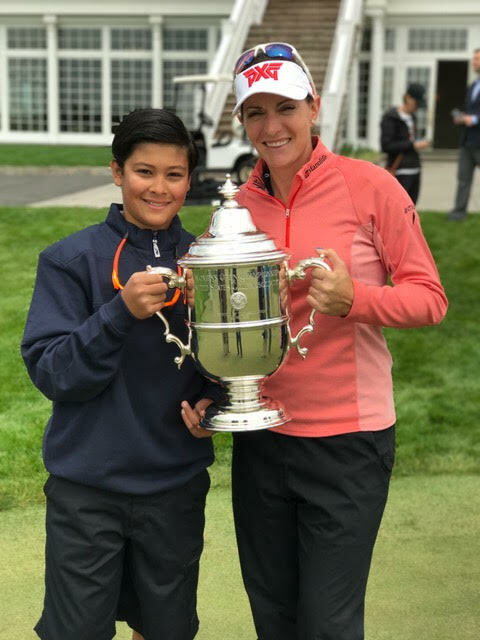 At Trump Bedminster Wednesday, Lang, the reigning U.S. Women’s Open Golf Champion, hosted a youth clinic along with 2007 champ Cristie Kerr and world No. 1 Lydia Ko. Some of the participants were as young as six years old. The event was part of media day for the LPGA U.S. Open, which will run from July 13–16 this year. The USGA, golf’s governing body, wants more kids to experience the benefits and joys of golf. That’s why, at this year's Open, all juniors accompanied by adults can attend for free. The hope is that among the crowd of spectators will be the next Brittany Lang. Lang fell in love with golf because of its individual nature. With no teammates, she learned to rely on herself and enjoy the experience of being alone. Lang hopes to defend her title as best she can starting July 13 in Bedminster and keep the Harton S. Semple trophy in her kitchen, where it has been for the past year.